Groningen is a city of students. Here, every fifth inhabitant of the city is a student. 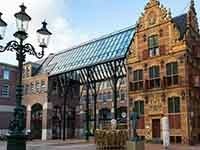 In addition, Groningen is the economic capital of northern Holland. In 1997, in this dynamic city, the first IKEA store was opened.